I recently migrated to Shopify from other platform and really excited to be here. I am new in the Shopify Community and my apology, if I write or act something (hopefully not) not exactly according community rules. 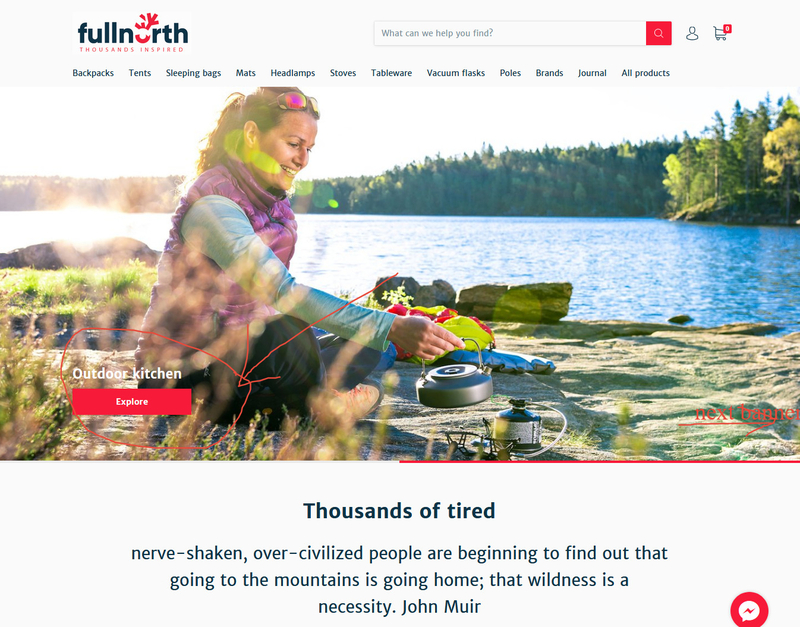 I have just launched new European e-store for outdoor gear called www.fullnorth.com and would like to get your feedback on it. - Overall design, layout. Is it clear and easy enough understandable? - Product navigation, product categorization. Is it clear, acceptable? - Filtering options for specific product groups. Is it easy enough to find product according your needs? Any additional filtering options required? - Language mistakes. English is my second language, thanks for showing it, if you see any. I just had look into your website. It's really great looking. I suggest one thing user may not scroll down the page to view your banner images, See this image https://snag.gy/R6C9za.jpg. And you can add/enable the open the items in new tab, Due to this visitors are stay more time on your website. And social media links under footer section, These are also enable the open that link in new tab. And follow this image https://snag.gy/CMmYtP.jpg. I like your store very much, it looks quite complete, there are few things i noticed. - On product page you have mentioned the manufacturer link but if you click on it gives 404 error from this product - https://fullnorth.com/collections/kids/products/lafuma-yukon-5-jr-extend you may remove the manufacturer link unless it is compulsion, moreover it diverts the visitors from yours to manufacturer website. There are a decent number of things that need fixed to make tour store trustworthy and optimized to bring in sales. Your menu has way too many items on it. Not sure if it is like this on desktop but on mobile it is huge. I would find a way to make it smaller and more manageable. Change your add to cart button to a different color. Red normally means error or stop so it isn’t the ideal color for the buttons you want people to push. Why does your site not have a footer? In your footer you should have all your policy pages, about us, contact info etc. You have none of that. When an item is added to the cart you want the cart to open up. Don’t force customers to have to try and find the cart.